Pentabus develop and produce new plays about the contemporary rural world. Touring around the country to a range of venues, Pentabus tell stories with local impact and national resonance. One of several companies born out of the 1970s movement that saw theatre getting directly to disenfranchised communities – on tour, in the regions or to areas of low cultural engagement. Theatre was taken to fields, pubs, village halls and community spaces as these dynamic movements reclaimed culture for every day people everywhere across the country. Pentabus still develops and tours original new work about the rural world, although our reach is now a national one, rather than an explicitly regional one. Along with Paines Plough and the ITC itself, we have recently celebrated the 40th birthday of the company. Born out of and into a challenging political and social climate, these companies continue to offer a social and cultural relevance to communities today. We are currently delving into our archive and it's fascinating to see how the world has changed – particularly for rural communities. In this patch of the world 40 years ago there were no regional theatres– no Theatre Severn in Shrewsbury and no Courtyard in Hereford. There was no professional theatre company here. Public transport was difficult and it was rare to have one let alone two cars per household. More broadly there were no mobile phones. No internet. No Sky Arts on TV. No digital theatre broadcasts. And yet despite all these changes and the diversification of the cultural offer it's fascinating to see how many of the challenges remain the same. Recent DEFRA reports reveal that only 42% of rural communities have a regular bus service (compared to 96% in urban areas) and 23% of rural households are in fuel poverty. 47% of sparse rural communities have no access to the internet or very slow broadband access. The disparity in income in rural communities has never been greater and youth unemployment in the countryside is growing at a faster rate than our urban counterparts. This is how we still know there a need for a company like us. Milked is a brand new play written by the fantastic Simon Longman. 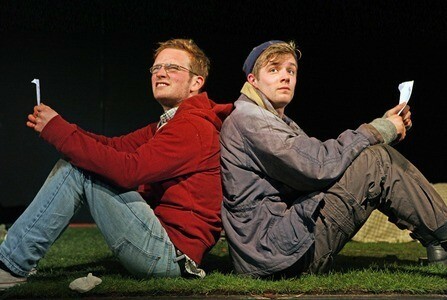 A black comedy about youth unemployment in the countryside, it’s a piece of theatre that asked big questions. In 2013 we co-produced it with The Courtyard in Hereford and our friends at the Royal Court live streamed it across the globe. One of our audience members told us we had to take it to Westminster and another wrote to us to tell us how much Pentabus meant to her and this was the play that had made her put pen to paper, in an email that stretched over 2 pages and reflected over 20 years of engagement with Pentabus. Milked will tour nationally in 2015 and we continue to commission upcoming and award winning playwrights to bring relevant new theatre to our audiences. Feel free to get in touch. You can email us at info@pentabus.co.uk or tweet us @pentabustheatre or join our Facebook group.